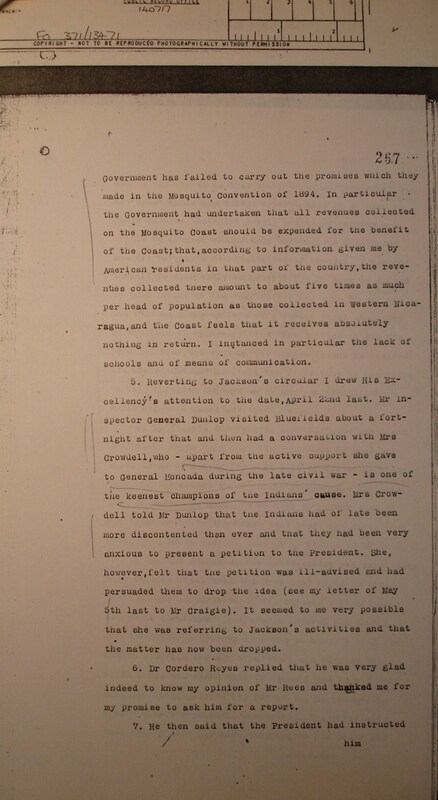 THIS IS THE FOURTH PAGE of documents for the FIRST HALF of 1929 on Nicaragua's Caribbean Coast, housing materials dated during the 69 days from April 23 to June 30. Especially noteworthy here are the first set of despatches from British Chargé d’Affaires Stanford London on “The Mosquito Indian Question” (May 5), which continue later on the page (20 & 21 June). 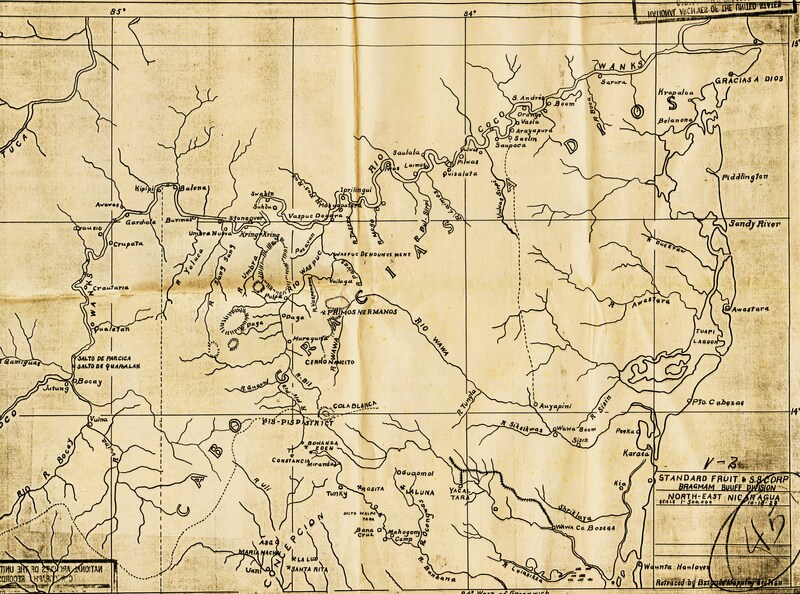 Also significant is the 17 May report by Colonel John Marston on the “Reorganization of the Area of the East,” which can be fruitfully read alongside new Eastern Area Commander Major C. H. Metcalf’s letter to Col. Rhea (31 May). 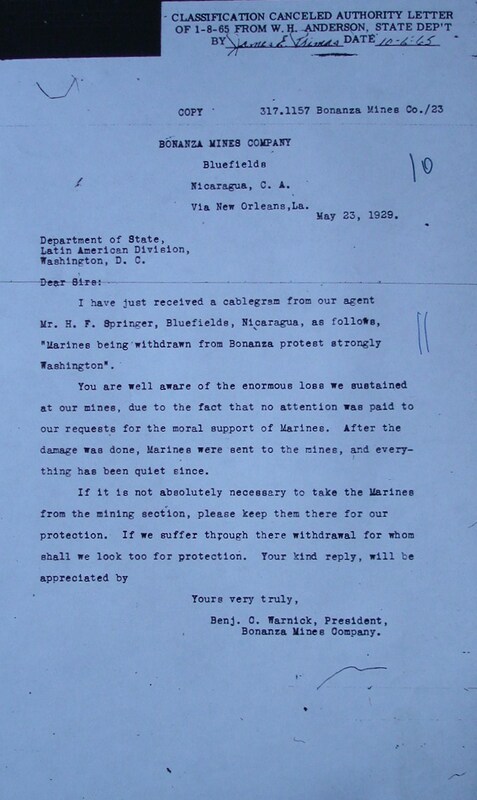 From these & other reports & letters, we learn that the Marines are seriously considering withdrawing from the entire Eastern Area — a prospect that does not sit well with the president of the Bonanza Mines Company (23 May). The Bluefields Weekly continues to express concern about the region’s economic situation, while the Marines & Guardia continue their unsuccessful efforts to locate & destroy the EDSN bands far in the interior. 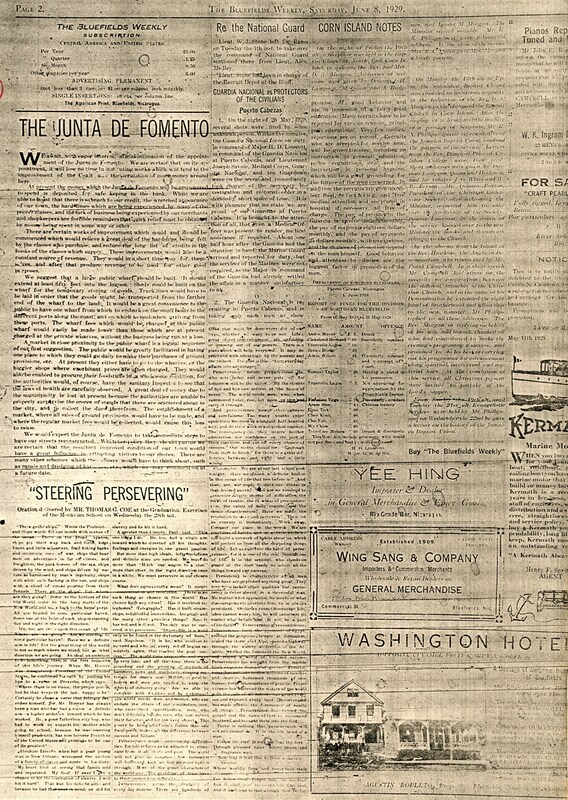 By the end of the period covered on this page, Sandino has left Nicaragua for Mexico, where he will remain for a full year. Miskitu Indian Question, British Chargé d'Affaires Stanford London, Managua, to Mr. Craigie, British Foreign Office, p. 1. Miskitu Indian Question, British Chargé d'Affaires Stanford London, Managua, to Mr. Craigie, British Foreign Office, p. 2. Miskitu Indian Question, British Chargé d'Affaires Stanford London, Managua, to Mr. Craigie, British Foreign Office, p. 3. Miskitu Indian Question, British Chargé d'Affaires Stanford London, Managua, to Mr. Craigie, British Foreign Office, p. 4. Miskitu Indian Question, British Chargé d'Affaires Stanford London, Managua, to Mr. Craigie, British Foreign Office, p. 5. Recommendation for award for services in Nicaragua in the case of Major Harold H. Utley, U. S. Marine Corps, from Brigadier General Logan Feland, USMC, to the Major General Commandant. Statement of 1st Lt. Vernon M. Guymon, USMC, Aviation Detachment, Puerto Cabezas. Statement of Captain Rose on air patrols over Rio Grande. Reorganization of the Area of the East, Eastern Area Commander Col. John Marston, Bluefields, to Jefe Director GN, Managua, p. 1. "1. There is submitted herewith a plan for the reorganization of the Area of the East, to be made effective June 1, 1929, and carried out as rapidly as recruits can be trained and sent out to the outlying stations. From present indications, the distribution of the Guardia as recommended herein can be completed by September 1st. ¶ 2. The establishment of an Area Headquarters, and two departments to be known as the Department of Bluefields and the Department of Puerto Cabezas, is recommended. An Area Headquarters has never been organized. It is now practically a part of the organization of the present Department of Bluefields, and the Area Commander has been in fact the Commander of that Department in addition to his duties as Area Commander. ¶ 3. The recommendations for the reorganization of this Area are given below. Throughout this letter the left hand column shows present organization and strength (as of May 10, 1929) not including recruits under training. The right hand column shows proposed organization and strength not including recruits under training. ¶ HEADQUARTERS, AREA OF THE EAST, at Bluefields. ¶ Present organization and strength – 1 colonel, commanding ¶ Proposed organization and strength – 1 colonel, commanding; 1 major, inspector; 1 major (or captain) medical; 1 captain, QM, PM, and Disbursing Agent; 1 lieutenant, adjutant; 1 sergeant major; 1 quartermaster sergeant; 1 first sergeant, medical; 1 sergeant, medical; 1 sergeant, for QM duty; 1 sergeant (or corporal) for PM duty; 1 corporal, for QM duty; 2 corporals, medical; 3 privates . . . "
Reorganization of the Area of the East, Eastern Area Commander Col. John Marston, Bluefields, to Jefe Director GN, Managua, p. 2. " . . . Total for Area Headquarters: ¶ Present organization and strength – 1 officer ¶ Proposed organization and strength – 5 officers and 17 enlisted ¶ DEPARTMENT OF BLUEFIELDS, ¶ At Bluefields ¶ Present organization and strength – 1 captain, commanding; 1 captain, medical; 1 lieutenant, QM; 1 lieutenant, medical; 1 lieutenant, cadet; 1 1st sergeant; 1 sergeant; 8 corporals; 7 privates; 3 privates, medical ¶ Total present organization and strength – 5 officers and 49 enlisted ¶ Proposed organization and strength – 1 captain, commanding; 2 lieutenants; 1 lieutenant, medical; 1 lieutenant, QM; 1 1st sergeant; 3 sergeants; 8 corporals; 1 corporal, medical; 46 privates; 2 cornets ¶ Total proposed organization and strength – 5 officers and 61 enlisted ¶ EL BLUFF RECRUIT DEPOT ¶ (not including recruits under training) ¶ Present organization and strength – 1 lieutenant in charge; 1 1st sergeant; 1 private; 1 private, medical ¶ Total present organization and strength – 1 officer and 3 enlisted ¶ Proposed organization and strength – 1 lieutenant in charge; 1 lieutenant, medical; 1 1st sergeant; 1 sergeant; 1 corporal; 1 corporal, medical, 3 privates ¶ Total proposed organization and strength – 2 officers and 7 enlisted ¶ LAS PERLAS ¶ Present organization and strength – 1 corporal; 2 privates ¶ Total present organization and strength – 3 enlisted ¶ Proposed organization and strength – 1 corporal, 7 privates ¶ Total proposed organization and strength – 8 enlisted ¶ PUNTA GORDA ¶ Present organization and strength – NONE ¶ Proposed organization and strength – 1 corporal, 3 privates ¶ 4 enlisted ¶ SAN JUAN DEL NORTE ¶ Present organization and strength - 1 corporal; 2 privates ¶ Total present organization and strength – 3 enlisted ¶ Proposed organization and strength – NONE ¶ Total for Bluefields Hdqtrs and District of Bluefields ¶ Present organization and strength – 5 officers and 58 enlisted ¶ Proposed organization and strength – 7 officers and 80 enlisted ¶ DISTRICT OF RAMA, DEPARTMENT OF BLUEFIELDS ¶ RAMA ¶ Present organization and strength – 1 lieutenant; 1 corporal, medical; 6 privates ¶ Proposed organization and strength – 1 lieutenant; 1 sergeant; 2 corporals; 1 corporal, medical; 17 privates . . . "
Reorganization of the Area of the East, Eastern Area Commander Col. John Marston, Bluefields, to Jefe Director GN, Managua, p. 3. " . . . Total present organization and strength - 1 officer and 7 enlisted ¶ Total proposed organization and strength – 1 officer and 21 enlisted ¶ GUADALUPE ¶ Present organization and strength – 2 privates ¶ Total present organization and strength – 2 enlisted ¶ Proposed organization and strength – 1 corporal; 3 privates ¶ Total proposed organization and strength – 4 enlisted ¶ Total for district of Rama ¶ Present organization and strength – 1 officer and 9 enlisted ¶ Proposed organization and strength – 1 officer and 25 enlisted ¶ DISTRICT OF LA CRUZ DEPARTMENT OF BLUEFIELDS ¶ LA CRUZ ¶ Present organization and strength – 1 lieutenant; 1 sergeant; 6 privates ¶ Proposed organization and strength – 1 lieutenant; 1 lieutenant (medical) 1 sergeant; 2 corporals; 1 corporal (medical); 17 privates ¶ EL GALLO ¶ Present organization and strength – NONE; ¶ Proposed organization and strength – 1 corporal; 7 privates ¶ TUMARIN ¶ Present organization and strength – 2 privates ¶ Proposed organization and strength – 1 corporal; 3 privates ¶ RIO GRANDE ¶ Present organization and strength - 1 sergeant; 3 privates ¶ Proposed organization and strength – 1 sergeant; 7 privates ¶ TOTAL FOR DISTRICT OF LA CRUZ ¶ Total present organization and strength – 1 officer, 13 enlisted ¶ Total proposed organization and strength – 2 officers, 41 enlisted ¶ TOTAL FOR DEPARTMENT OF BLUEFIELDS ¶ Present organization and strength – 8 officers, 80 enlisted, total – 88 ¶ Proposed organization and strength – 10 officers, 146 enlisted, total – 156 ¶ DEPARTMENT OF PUERTO CABEZAS . . . "
Reorganization of the Area of the East, Eastern Area Commander Col. John Marston, Bluefields, to Jefe Director GN, Managua, p. 4. " . . . (HDQTRS. AT PUERTO CABEZAS) ¶ Present organization and strength – 1 captain; 1 lieutenant; 1 lieutenant (medical); 1 sergeant; 2 corporals; 8 privates ¶ Proposed organization and strength – 1 major; 1 lieutenant; 1 lieutenant (medical); 1 lieutenant (QM); 1 1st sergeant; 2 sergeants; 6 corporals; 1 corporal (medical); 38 privates; 2 cornets ¶ RECRUIT DEPOT. (tentative) ¶ Present organization and strength – NONE. ¶ Proposed organization and strength – 1 lieutenant; 1 1st sergeant; 1 sergeant; 1 corporal; 2 privates ¶ AT WAWA CENTRAL ¶ Present organization and strength – 1 sergeant; 4 privates ¶ Proposed organization and strength – 1 sergeant; 8 privates ¶ TOTAL AT PUERTO CABEZAS ¶ Present organization and strength – 3 officers; 16 enlisted ¶ Proposed organization and strength – 5 officers, 64 enlisted ¶ DISTRICT OF GABO CRACIAS ¶ Present organization and strength – NONE. ¶ Proposed organization and strength – 1 lieutenant; 1 sergeant; 1 corporal; 12 privates ¶ TOTAL FOR DISTRICT ¶ Present organization and strength – NONE. ¶ Proposed organization and strength – 1 officer; 14 enlisted ¶ DISTRICT OF PRINZAPOLKA ¶ Present organization and strength – NONE. ¶ Proposed organization and strength – 1 lieutenant; 1 sergeant; 1 corporal; 12 privates ¶ AT WALPASICRA ¶ Present organization and strength – NONE. ¶ Proposed organization and strength – 1 corporal; 3 privates ¶ TOTAL FOR DISTRICT ¶ Present organization and strength – NONE. ¶ Proposed organization and strength – 1 officer; 18 enlisted ¶ TOTAL FOR DEPARTMENT ¶ Present organization and strength – 3 officers; 16 enlisted ¶ Proposed organization and strength – 7 officers; 96 enlisted . . . "
Reorganization of the Area of the East, Eastern Area Commander Col. John Marston, Bluefields, to Jefe Director GN, Managua, p. 5. " . . . TOTAL FOR AREA ¶ Present organization and strength – 11 officers; 96 enlisted ¶ Proposed organization and strength – 21 officers, 151 enlisted ¶ 4. It is believed that above distribution both in location and personnel is justified by the local conditions in each district. 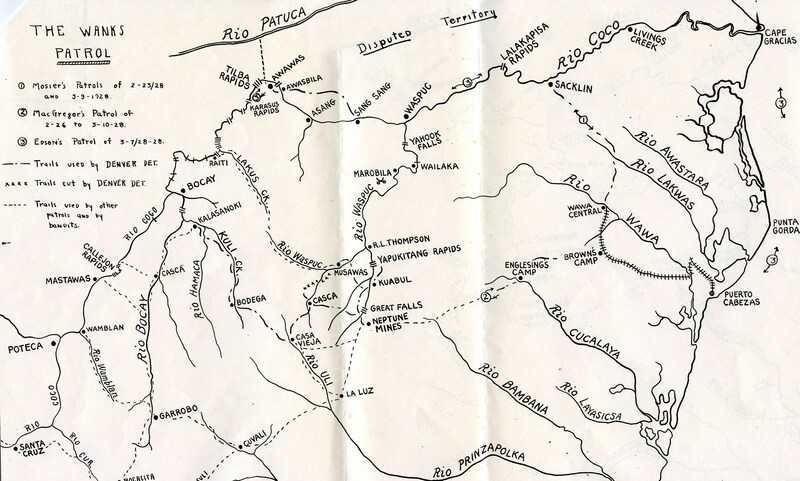 The Coco River, until the extension of the Bragmans Bluff Railroad to Waspook [Huaspuc] the construction of which is now under way, can be patrolled once a week from Cabo Gracias. The area in the Coco River region is quiet and promises to remain so. Garrisons at La Cruz and Rama are increased to afford better protection along the Escondido and Grande Rivers. The Guardia should be able to relieve the Marines of further duty at El Gallo as soon as the proposed detachment can be sent to that place. The Prinzapolka region has no Guardia at present. The new station proposed should afford adequate protection to the regions about Prinzapolka and Walpasisca. A garrison at Puerto Cabezas is increased to take care of the constantly increasing extension of the Bragman’s Bluff Lumber Company which is now working toward Waspook in the Coco River. It is contemplated to relieve the marines of any further police duty in the Area as soon as possible. ¶ 5. The establishment of any station in the Coco River at present is not recommended. Marine officers cognizant of affairs in this region concur in this opinion. The cost of furnishing supplies to Marine detachments on this river had been as high as 13 cents a pound and no conditions at present warrant the expenditure of public funds for the maintenance of posts on this stream. 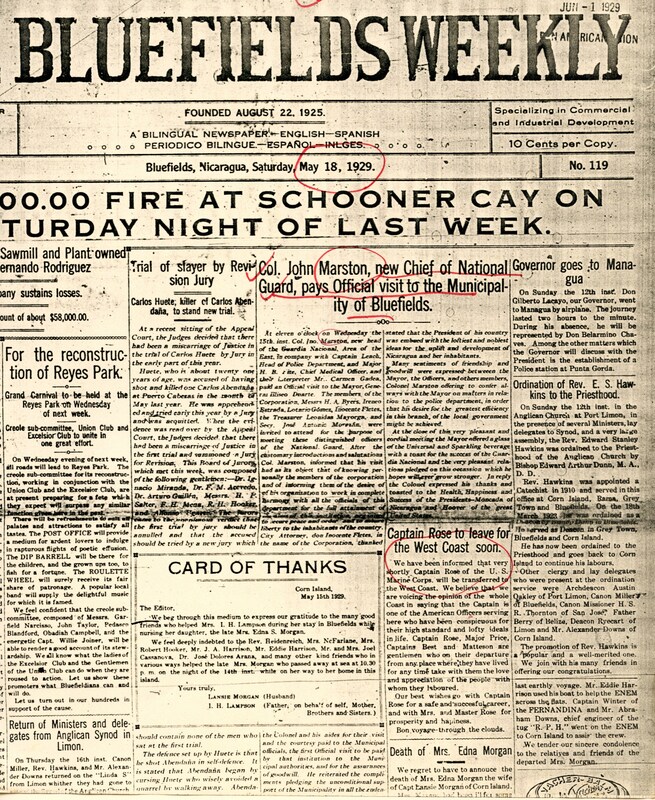 ¶ Colonel John Marston"
"Col. John Marston, new Chief of National Guard, pays Official visit to the Municipality of Bluefields," The Bluefields Weekly, p. 1. The Bluefields Weekly, p. 2. 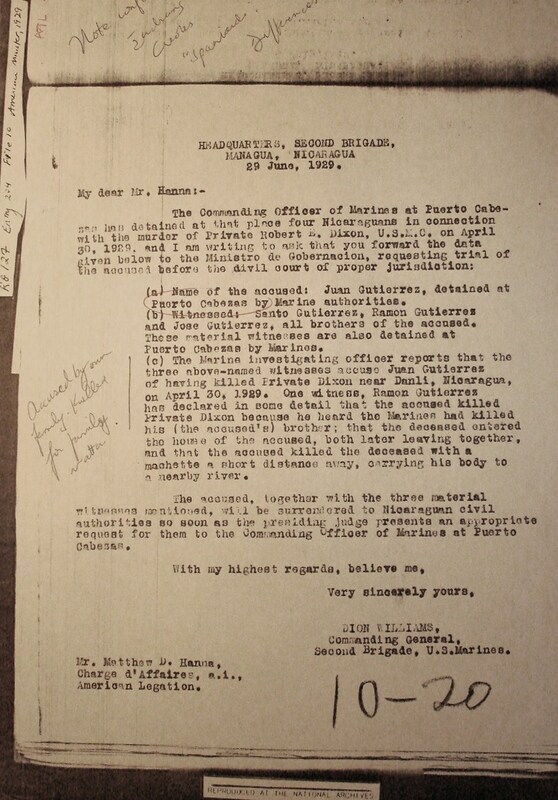 Memo from 1st Lt. W. C. Hall, Puerto Cabezas, to Capt. Rose, Puerto Cabezas, p. 1. 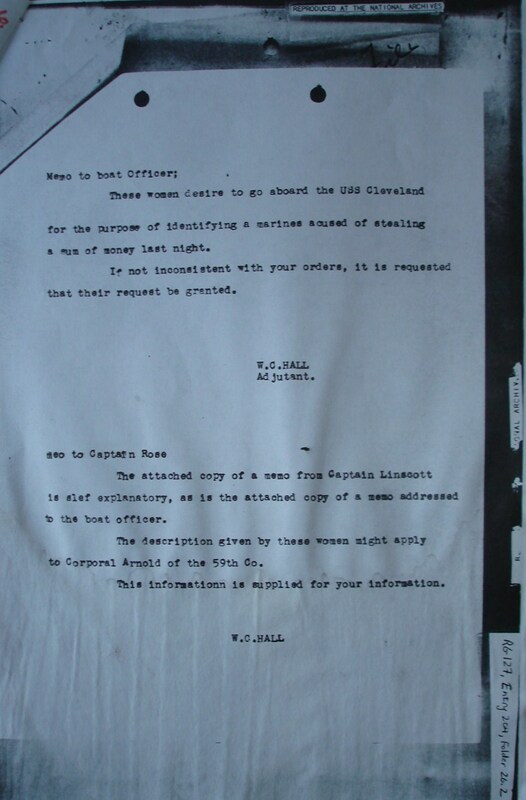 "The attached copy of a memo from Captain Linscott [below] is self explanatory, as is the attached copy of a memo addressed to the boat officer. The description given by these women might apply to Corporal Arnold of the 59th Co. This information is supplied for your information." 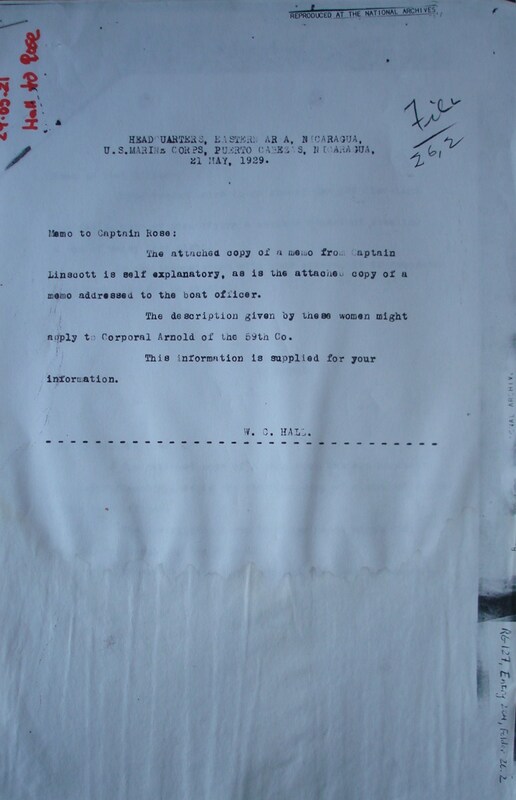 Memo from 1st Lt. W. C. Hall, Puerto Cabezas, to Capt. Rose, Puerto Cabezas, p. 2. "Memo to boat officer [from Capt. Linscott]: These women desire to go aboard the USS Cleveland for the purpose of identifying a marines acused [sic] of stealing a sum of money last night. If not inconsistent with your orders, it is requested that their request be granted." Letter from Benjamin C. Warnick, President, Bonanza Mines Company, Bluefields, Nicaragua, C.A. via New Orleans, La., to Department of State, Latin American Division, Washington D.C. "Dear Sirs: I have just received a cablegram from our agent Mr. H. F. Springer, Bluefields, Nicaragua, as follows: 'Marines being withdrawn from Bonanza protest strongly Washington.' You are well aware of the enormous loss we sustained at our mines, due to the fact that no attention was paid to our requests for the moral support of Marines. After the damage was done, Marines were sent to the mines, and everything has been quiet since. If it is not absolutely necessary to take the Marines from the mining section, please keep them there for our protection. If we suffer through there withdrawal for whom shall we look for protection. Your kind reply, will be appreciated by, Yours very truly, Benj. C. Warnick, President, Bonanza Mines Company." 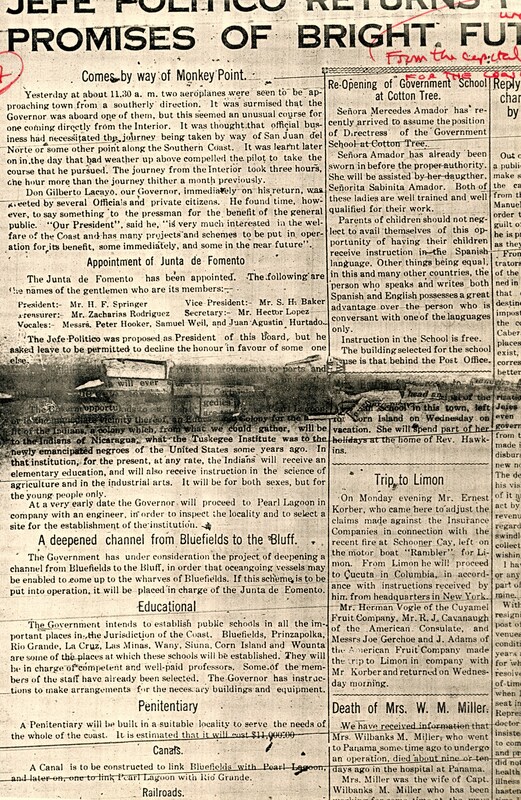 "The Departure of the Marines," The Bluefields Weekly. Letter from Major Clyde H. Metcalf, Puerto Cabezas, to Col. R. Y. Rhea, Managua, p. 1. "I am sending under separate cover, and officially, a proposed plan for occupying the Eastern Area of Nicaragua with our reduced strength. As a supplement, I am taking the liberty to point out a few other changes which might be made provided political and other pressure can be overcome. ¶ I understand that the occupation of the La Luz and Neptune mining area is being continued largely on account of political influence of their owners in the States and elsewhere. ¶ While in Bluefields a short time ago, I had a long talk with Dr. Marchand who is at present the representative of the Los Angeles and La Luz Mining Company in this country. That company, I believe, owns practically all claims in the vicinity of La Luz, which is now being guarded by a detachment of thirty six Marines. Dr. Marchand told me that practically all property of that mining company, except a few small buildings which could be destroyed, has already been destroyed. He stated that the only damage which the natives or anyone else could do would be to work the gold claims and take such gold as they could get by hand process. Captain Linscott who returned from the command of that area about two weeks ago, reported that conditions are substantially the same as given above. ¶ So it would seem that the Marines are guarding these mines for the sole purpose of preventing a few individuals from working these claims. 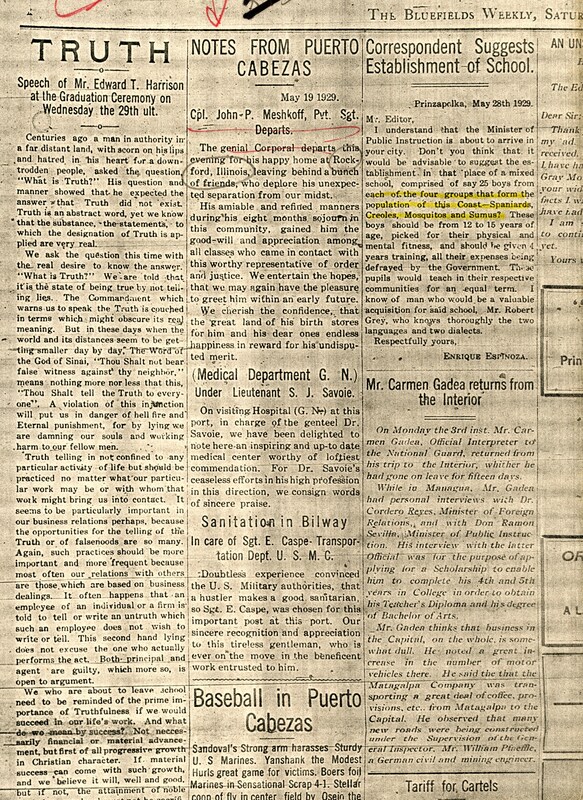 Dr. Marchand told me that he would communicate with Mr. Fletcher of New York, who is the principal owner of these mines, to see if Mr. Fletcher would be satisfied for us to withdraw from there and not use further political pressure through his brother, former Ambassador Fletcher, to keep us from pulling out of there. I have heard nothing in connection with this matter so far. ¶ The situation with reference to the Neptune mining area is slightly different. The crushers at the Bonanza Mine were wrecked beyond repair and that mine is now being worked on a small scale with a modified crushing process and with the idea of making it pay expenses only. That, I believe, is the only mining actually going on in either of those mining areas at the present time. ¶ As you doubtless know, it is a difficult problem, especially after our planes have been taken away, to supply these two detachments. Boat transportation alone costs from five to six hundred dollars a month for forwarding supplies to them. The boat trip . . . "
Letter from Major Clyde H. Metcalf, Puerto Cabezas, to Col. R. Y. Rhea, Managua, p. 2. "[ . . . ] sacrifice to the Marines and to the Government to continue guarding these mining areas when so little good is apparently being done by the Marines up there. ¶ I am not entirely familiar with the political pressure being brought to bear to maintain the Marines in these Areas but it appears to me highly desirable to get them withdrawn if we can do so. ¶ Major Bourne is over with me today, and assured me that Brigade was anxious to evacuate these areas as soon as possible and for that reason I have taken the liberty to write you the above which I believe covers the situation to the best of my knowledge and belief." The Bluefields Weekly, p. 1. "OLD GLORY removed to the Bluff ¶ For several months past the sight of the American and Nicaraguan flags flying in the Palace yard has not failed to arrest the attention of the most casual observer who has had occasion to pass the Palace. A few mornings ago, on walking past the parade ground, one observed that something was lacking from the accustomed view of things. What was wrong? The American flag had been removed, and had been taken by the marines to their new quarters at the Bluff. So great is the sentiment attached to a national emblem that one cannot help becoming attached in some way or other to a flag that one has seen for months, even though it be a foreign one. Without disrespect or disloyalty to our own flag we say that OLD GLORY will be missed for some time to come." The Bluefields Weekly, p. 2. 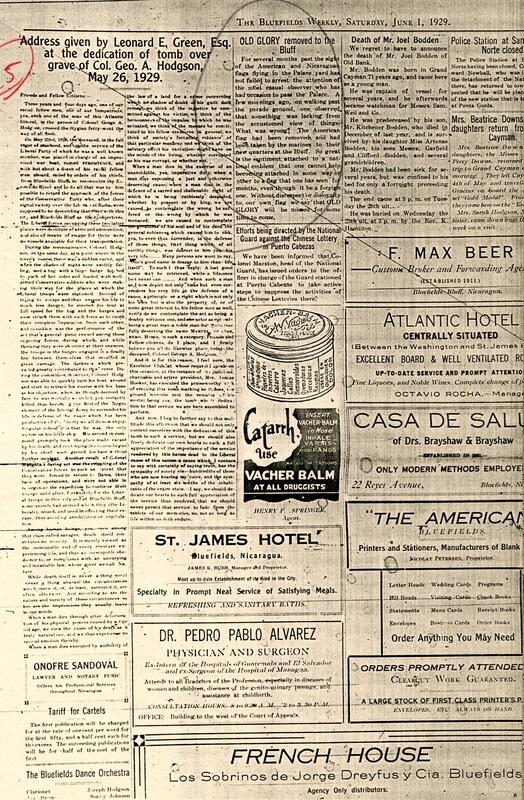 "NOTES FROM PUERTO CABEZAS ¶ May 19,1929. ¶ Cpl. John P. Meshkoff, Pvt. Sgt. Departs. ¶ The genial Corporal departs this evening for his happy home at Rockford, Illinois, leaving behind a bunch of friends, who deplore his unexpected separation from our midst. ¶ His amiable and refined manners during his eight months sojourn in this community, gained him the good will and appreciation among all classes who came in contact with this worthy representative of order and justice. We entertain the hopes, that we may again have the pleasure to greet him within an early future. ¶ We cherish the confidence that the great land of his birth stores for him and his dear ones endless happiness in reward for his undisputed merit. ¶ CORRESPONDENT SUGGESTS ESTABLISHMENT OF SCHOOL.¶ Prinzapolka, May 28th 1929 ¶ Mr. Editor,¶ I understand that the Minister of Public Instruction is about to arrive in your city. Don’t you think that it would be advisable to suggest the establishment in that place of a mixed school, comprised of say 25 boys from each of the four groups that form the population of this Coast—Spaniards, Creoles, Mosquitos, and Sumus? These boys should be from 12 to 15 years of age, picked for their physical and mental fitness, and should be given 4 years training, all their expenses being defrayed by the Government. These pupils would teach in their respective communities for an equal term. I know of(a) man who would be a valuable acquisition for said school, Mr. Robert Grey, who knows thoroughly the two languages and two dialects. ¶ Respectfully yours, Enrique Espinoza." The Bluefields Weekly, p. 3. "BASEBALL IN PUERTO CABEZAS ¶ Sandoval’s Strong arm harasses Sturdy U.S. Marines. Yanshank the Modest Hurls great game for victims. Boers foil Marines in Sensational Scrap 4-1. Stellar coop of fly in center field by Osejo the sensation of the day. ¶ By J.M. Guido. 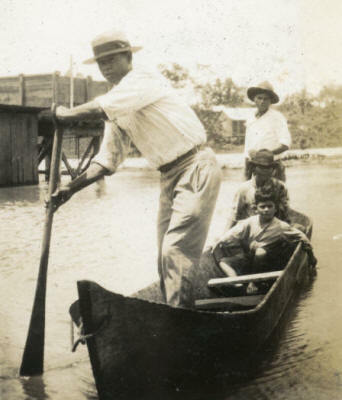 Puerto Cabezas May 19, 1929. ¶ Beneath a most attractive lapis blue sky, enjoyed but in this land of perpetual summer and embellished with tints of rose, the eager fans were treated to one of the most artistic performances viewed under the southern heavens this beautiful Sunday afternoon, put up by adroit Marines vs plucky Boers at Bragmans’ Field. ¶ From early and prior to the frantic ravel, the cheering crowd vegan to congregate at the baseball mecca, the Stadium, to see the great exhibition on the diamond. Uncle Sam’s worthy representative showed up in due time going thru formal warming up; moments later the Spanish tribe following similar tactics. After the usual preliminaries, the Leathernecks defiantly hooked the hickory, starting the ball a–rolling And looting their only skid in the first stanza. This ended their run-getting ability, for from here on Sandoval and destiny ordained it otherwise. Modest Yanshak’s phenomenal out-shoots, baffled the evil purpose of the Spanish adversary, which held it at bay from the third inning when Foxy Kowalak was retired to the bench when his efficiency on the mound was discovered by the opponents, causing three tallies to be recorded against his flock in first two merry-go-rounds. ¶ Not till the eighth frame did the Boers score again, pilfering one more run, thus feathering their nest and gliding on listless wings. The stars began to glow and away flew these happy ducks to revel over the day’s events, whilst the duped genteel Leathernecks still ponder in amazement over the gloomy results of the titanic feat. Another ball gone to…. (You know where)"
The Bluefields Weekly, p. 1. "Re: the National Guard ¶ Lieut. W.J. Stone left for Rama on Tuesday the 11th inst. to take over the command of National Guard stationed there from Lieut. Alex Medley. ¶ Lieut. Stone had been in charge of the Recruit Depot at the Bluff. ¶ GUARDIA NACIONAL AS PROTECTORS OF THE CIVILIANS ¶ Puerto Cabezas ¶ 1. On the night of 28 May, 1929, several shots were fired by some unknown person. Within five minutes, the Guardia Nacional force on duty, in command of Major H.D. Linscott, in command of the Guardia Nacional at Puerto Cabezas, and Lieutenant Joseph Savoie, Medical Corps, Guardia Nacional, were on the scene and immediately took charge of the necessary investigation and restored order in a decidedly short space of time. It is with pleasure that we state we are proud of our Guardias at Puerto Cabezas. It is brought to the attention of all, that given a medical Officer was present to render medical assistance if required. About one half hour after the Guardia had the situation in hand the Marine Guard arrived and reported for duty, but the services of the Marines were not required, as the Major in command of the Guardia had already settled the affair in a manner satisfactory to all. ¶ 2. The Guardia Nacional is recruiting in Puerto Cabezas, and is taking only such men as show promise of good behavior and are in possession of a fairly good education. Many recruits have to be rejected for various reasons, principally educational. Very few medical rejections are on record. Recruits who are accepted for service now, will be given training, including an instruction in general education, police regulations, drill, and the instruction in personal hygiene, which will be a good grounding for the future of the man concerned. In addition the recruits are given excellent food, clothing, and free medical attention, and are placed in hospital if necessary, all free of charge. The pay of privates in the Guardia is twelve dollars monthly, the pay of corporals eighteen dollars monthly, and the pay of sergeants 25 dollars monthly, with no expenses, and the chances of promotion depends on the man himself. Good behavior and attention to duties are the biggest factor in promotion of the men." The Bluefields Weekly, p. 2. (2 images). "Por la Moralidad Pública. Nuestra mesa de redacción, diferentes estimables personas de nuestra sociedad, a suplicarnos que digamos o hagamos algo, para ver de conseguir que los Jefes de La Guardia nacional, se dignen dedicar un poco mas de atención al mejoramiento moral de la Guardia bajo su mando, a fin de poner coto al desbordamiento de indecorosas y desordenadas pasiones y a tanta inmoralidad por ellos cometidas y que ya están hartos de presenciar. ¶ Desde las seis de la tarde y muchas veces durante el día, se da principio sobre la calle de “Patterson”, en la parte más central de la ciudad, a una serie de bailes, en ciertas cantinas que por allí í existen y que son frecuentadas por mujeres de vida licenciosa, en compañía de los guardias, quienes en vez de dedicarse a cumplir con los deberes de su cargo, llegan a formar, junto con ellas, los mayores escándalos. ¶ A cada momento se ven dentro de las referidas cantinas, en los corredores de las mismas, en la calle mencionada y en las adyacentes, cuadros inmorales en sumo grado, capaces de hacer ruborizarse a los mas despreocupados. ¶ El tener que decir que los principales autores de semejante inmoralidad, son los guardias, quienes amparados en la impunidad, por la seguridad que tiene de que no se les vigila y de que nadie es capaz de denunciarlos por el temor que se les tiene en todas partes; en vez de servir ellos de salvaguardia a los ciudadanos y ser los sostenedores de las instituciones de la República, se han convertido en verdadera amenaza. ¶ Cansado el vecindario honrado de la zona comprendida en la parte infestada de la ciudad, a que venimos refiriéndonos, han llegado a suplicarnos digamos algo de todo esto, para ver si es posible poner coto a tanta informalidad y tanto escándalo; y nosotros a nuestra vez haciéndonos eco de los clamores del pueblo pedimos a las Autoridades superiores y muy especialmente al señor jefe de la Guardia Nacional, de quien estamos seguros ignora todas estas irregularidades, ponga un pronto y eficaz remedio a este mal, que tanto daño causa a esta sociedad que esta bajo su salvaguardia, como jefe superior de La Guardia Nacional, que ha sido creada con este fin. ¶ Tenemos fe en que se nos atenderá y se hará justicia. ¶ Nuestro corresponsal de Puerto Cabezas, refiriéndose a la Guardia Nacional de aquel lugar dice entre otras cosas lo siguiente: ¶ “Actualmente están dándole instrucción civil, militar y moral a una falange de indios y criollos nicaragüenses. Aquí todas las actividades de los guardias son dignas de aplaudirse”. ¶ Cuándo podremos decir otro tanto de la guardia nacional de esta ciudad? ¶ Esperamos poder consignarlo muy pronto en nuestras columnas." The Bluefields Weekly, p. 3. 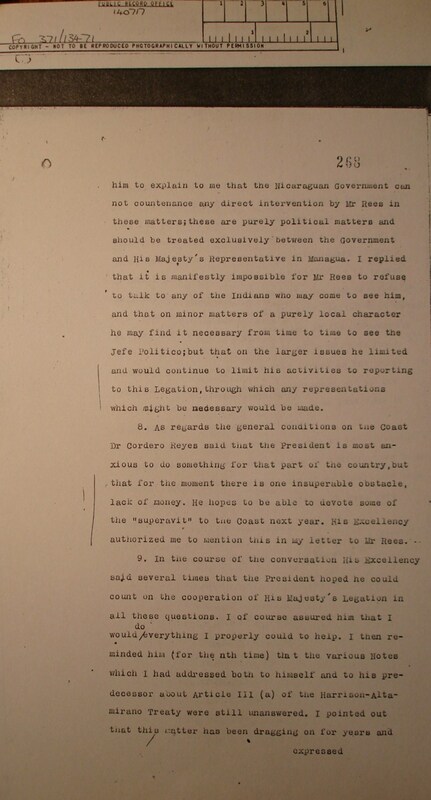 Cable from British Chargé d'Affaires Stanford London, Managua, to British Foreign Office, London, re Miskitu Indian Petition, p. 1. "The Minister for Foreign Affairs asked me to go and see him this afternoon and then handed me the annexed document, which, he said, is a copy of a circular which has been sent to all the Indiana villages on the Mosquito Coast. ¶ 2. 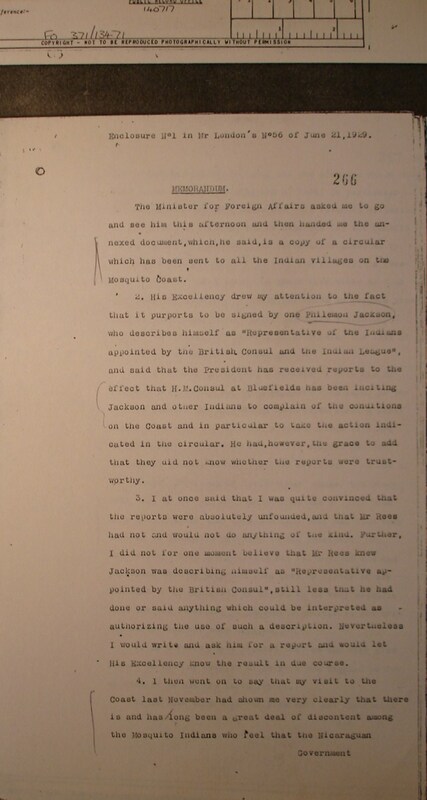 His Excellency drew my attention to the fact that it purports to be signed by one Philemon Jackson, who describes himself as ‘Representative of the Indians appointed by the British Consul and the Indian League’, and said that the President has received reports to the effect that H. M. Consul at Bluefields has been inciting Jackson and other Indians to complain of the conditions on the Coast and I in particular to take the action indicated in the circular. He had, however, the grace to add that they did not know whether the reports were trustworthy. ¶ 3. I at once said that I was quite convinced that the reports were absolutely unfounded, and that Mr. Rees had not and would not do anything of the kind. Further, I did not for one moment believe that Mr. Rees knew Jackson was describing himself as ‘Representative appointed by the British Consul’, still less that he had done or said anything which could be interpreted as authorizing the use of such a description. Nevertheless I would write and ask him for a report and would let his Excellency know the result in due course. ¶ 4. I then went on to say that my visit to the Coast last November had shown me very clearly that there is and has long been a great deal of discontent among the Mosquito Indians who feel that the Nicaraguan . . . "
Cable from British Chargé d'Affaires Stanford London, Managua, to British Foreign Office, London, re Miskitu Indian Petition, p. 2. " . . . Government has failed to carry out the promises which they made in the Mosquito Convention of 1894. 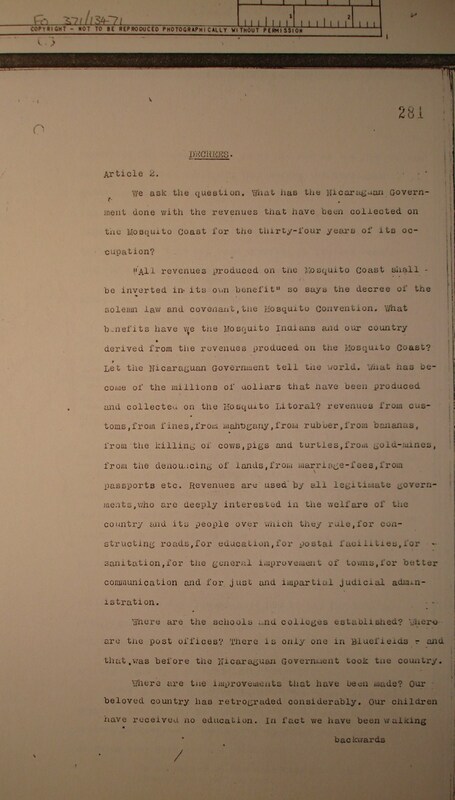 In particular the Government had undertaken that all revenues collected on the Mosquito Coast should be expended for the benefit of the Coast; that, according to information given as by American Presidents in that part of the country, the revenues collected there amount to about five times as much per head of population as those collected in Western Nicaragua, and the Coast feels that it receives absolutely nothing in return. I instanced in particular the lack of schools and of means of communication. ¶ 5. Reverting to Jackson’s circular I drew His Excellency’s attention to the date, April 2nd last. Mr. Inspector General Dunlop visited Bluefields about a fortnight after that and then had a conversation with Mrs. Crowdell, who – apart from the active support she gave to General Moncada during the late civil war – is one of the keenest champions of the Indians’ cause. Mrs. Crowdell told Mr. Dunlop that the Indians had of late been more discontented than ever and that they had been very anxious to present a petition to the President. She, however, felt that the petition was ill-advised and had persuaded them to drop the idea (see my letter of May 5th last to Mr. Craigie). It seemed to me very possible that she was referring to Jackson’s activities and that the matter has now been dropped. ¶ 6. Dr. Cordero Reyes replied that he was very glad indeed to know my opinion of Mr. Rees and thanked me for my promise to ask him for a report. ¶ 7. He then said that the President has instructed . . . "
Cable from British Chargé d'Affaires Stanford London, Managua, to British Foreign Office, London, re Miskitu Indian Petition, p. 3. " . . . him to explain to me that the Nicaraguan Government cannot countenance any direct intervention by Mr. Rees in these matters; these are purely political matters and should be treated exclusively between the Government and his Majesty’s Representative in Managua. I replied that it is manifestly impossible for Mr. Rees to refuse to talk to any of the Indians who may come to see him, and that as minor matters of a purely local character he may find it necessary from time to time to see the Jefe Politico; but that on the larger issues he limited and would continue to limit his activities to reporting in this Legation, through which any representations which might be necessary would be made. ¶ 8. As regards the general conditions on the Coast Dr. Cordero Reyes said that the President is most anxious to do something for that part of the country, but that for the moment there is one inseparable obstacle, lack of money. He hopes to be able to devote some of the ‘superavit’ to the Coast next year. His Excellency authorized me to mention this in my letter to Mr. Rees. ¶ 9. In the course of the conversation His Excellency said several times that the President hoped he could count on the cooperation of His Majesty’s Legation in all these questions. I of course assured him that I would do everything I properly could to help. I then reminded him (for the nth time) that the various Notes which I had addressed both to himself and to his predecessor about Article 111 (a) of the Harrison-Altamirano Treaty were still unanswered. I pointed out that this matter has been dragging on for years and . . . "
Cable from British Chargé d'Affaires Stanford London, Managua, to British Foreign Office, London, re Miskitu Indian Petition, p. 4. " . . . expressed my earnest hope that I should very soon receive satisfactory replies both as regards the general questions of exemption of the Indians from direct taxation (P.O. despatch No. 25 – A 3135/12/8 – of July 13, 1928) and also as regards the specific cases of Mrs. Crowdell (P.O. despatch No. 37 – A 5561/12/8 – of August 18, 1928) and the Bluefields Charity Tax (my despatch No 9 of February 2, 1929. His Excellency replied that these matters were engaging the attention of the Government; that they had asked the Governor of Bluefields for a detailed picture of the taxation levied on the Coast both on behalf of the central government and by the various local authorities, and that when that came to hand they hoped to answer my notes. ¶ 10. 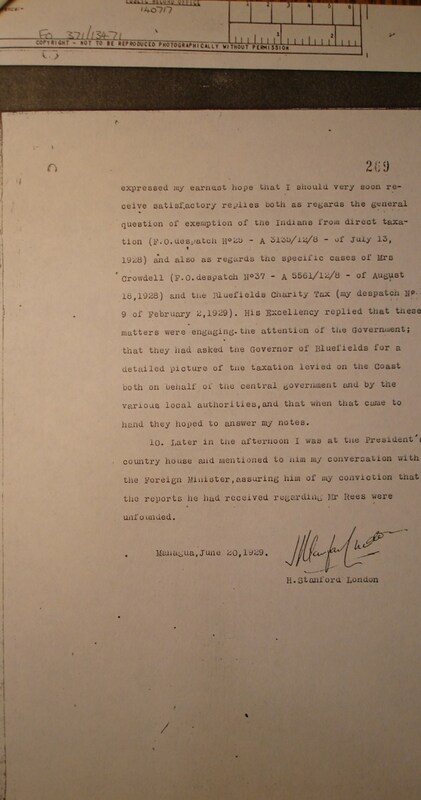 Later in the afternoon I was at the President’s country house and mentioned to him my conversation with the Foreign Minister, assuring him of my conviction that the reports he had received regarding Mr. Rees were unfounded. 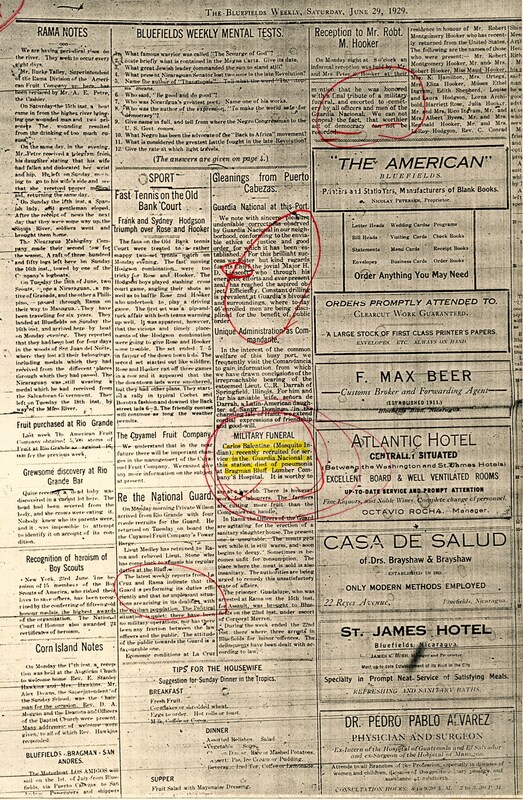 ¶ Managua, June 20, 1929. ¶ H. Stanford London"
Cable from British Chargé d'Affaires Stanford London, Managua, to British Foreign Office, London, re Miskitu Indian Petition submitted to Mrs. Anna Crowdell (but never formally submitted to British Gov't), p. 1. 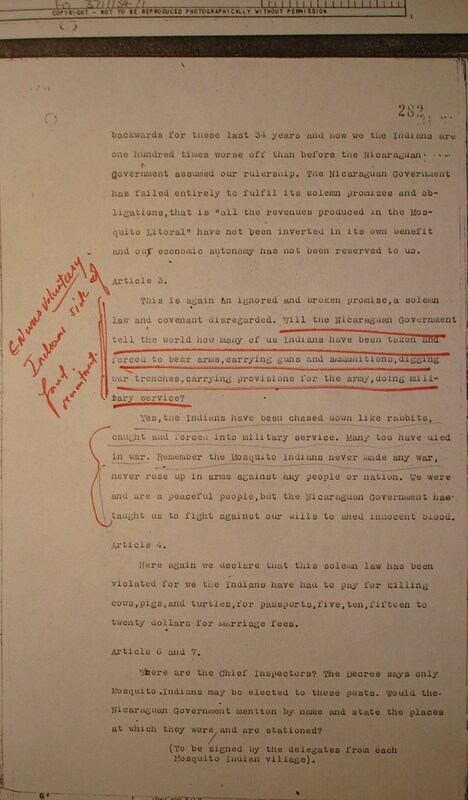 "Copy of a Petition prepared by certain Mosquito Indians for submission to the Nicaraguan Government. This document was given by Mrs. Crowdell to Mr. Inspector General Dunlop at Bluefields on May 2nd, 1929. She then stated that the idea of presenting the petition had been dropped. ¶ To His Excellency Jose Maria Moncada, President of the Republic of Nicaragua, and the National Assembly of the Nicaraguan Government. ¶ We the undersigned representatives of the Mosquito Indians, residing on the Mosquito Literal, do now respectfully beg to present for your esteemed consideration and final adjustment of a matter which very gravely and solemnly affects our country, the Mosquito Coast, and we as a people, our rights, our privileges, our liberty and advancement, socially, educationally, religiously and politically. 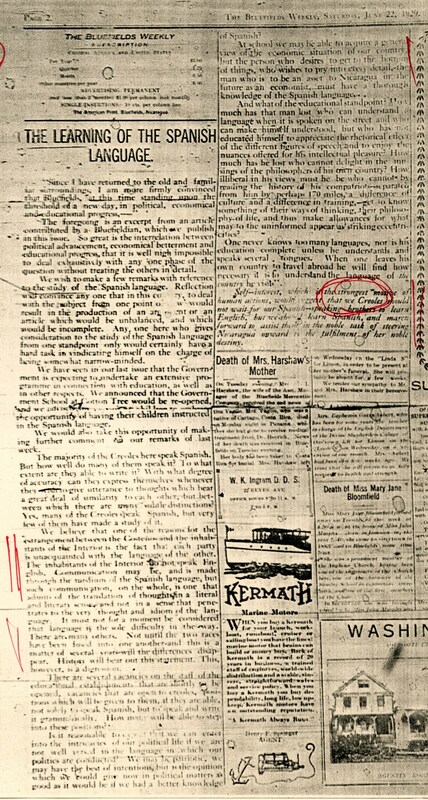 ¶ Be it known that a solemn law and covenant named the Mosquito Convention by which our country, the Mosquito Coast, was incorporated in the Republic of Nicaragua, was at the town of Bluefields, on the Mosquito Coast, on the 29th of November 1894, drawn up, made, agreed to and signed by the Mosquito Indians and the Nicaraguan Government, and that said solemn law and covenant the Mosquito Convention was given in the Hall of Sessions of the National Legislative Assembly, Managua, on the 27th February 1895, and also that the order for the execution of putting into effect this solemn law and covenant, the Mosquito Convention, was signed by the President of the Republic, His Excellency . . . "
Cable from British Chargé d'Affaires Stanford London, Managua, to British Foreign Office, London, re Miskitu Indian Petition submitted to Mrs. Anna Crowdell (but never formally submitted to British Gov't), p. 2. " . . . Jose Santos Zelaya at Managua on the 29th February 1895. ¶ Be it also known that whereas this solemn law and covenant, the Mosquito Convention, which was drawn up, agreed to, sworn to and signed by the Mosquito Indians and the Nicaraguan Government with the sole purpose and mutual understanding that a glorious future was in store for them, the Mosquito Indians, and their country, the Mosquito Coast, deriving therefrom great benefits of freedom, education, justice, protection and general attachment, has not been fulfilled by the Nicaraguan Government, but this solemn law and covenant, the Mosquito Convention, has been entirely disregarded, ignored and cast aside by the Nicaraguan Government and that said Nicaraguan Government has failed entirely to carry into effect the decree of this solemn law and covenant, the Mosquito Convention. 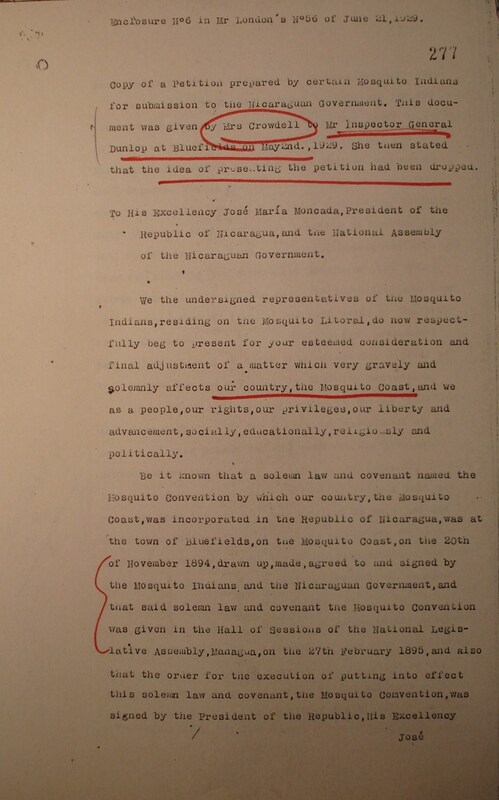 ¶ Be it known that in consequence of the non-fulfillment and utter disregard by the Nicaraguan Government of the decree of this solemn law and covenant, the Mosquito Convention, we the Mosquito Indians so now solemnly desire that this document, Mosquito Convention, become null and void and that the act of incorporation is annulled; and we further declare that we required absolutely no readjustment to this document the Mosquito Convention, but now claim our former rights to self-government and independence politically and economically. 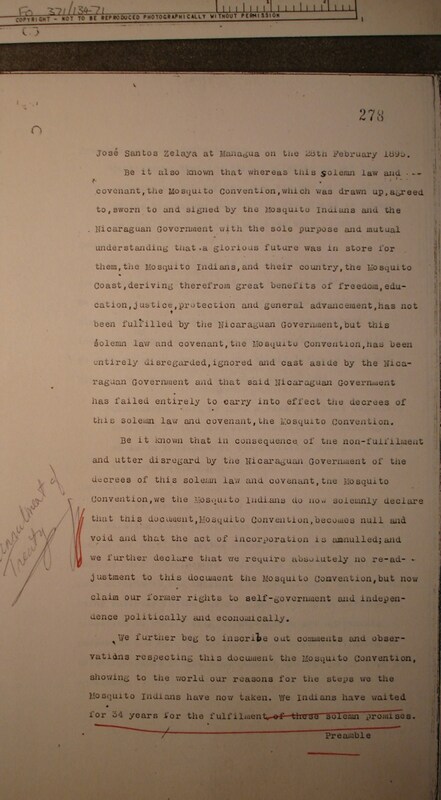 ¶ We further beg to inscribe out comments and observations respecting this document the Mosquito Convention, showing to the world our reasons for the steps we the Mosquito Indians have now taken. We Indians have waited for 34 years for the fulfillment of these solemn promises . . . "
Cable from British Chargé d'Affaires Stanford London, Managua, to British Foreign Office, London, re Miskitu Indian Petition submitted to Mrs. Anna Crowdell (but never formally submitted to British Gov't), p. 3. " . . . Preamble, from the Convention:- ¶ ‘Considering that the change effected on the 13th of February of the current year was due to the efforts of the Nicaraguan authorities, who wished to redeem us from the slavery in which we were found’ ¶ Comment. ¶ This above statement is not in accordance with the conditions which obtained before the 13th February 1894. We may and do ask – Who had us, the Mosquito Indians, in slavery? We the Mosquito Indians, from as far back as 1660 A.D. as history records, were always a free people. We were ruled by our kings and chiefs, living a free and happy life according to our customs and laws. 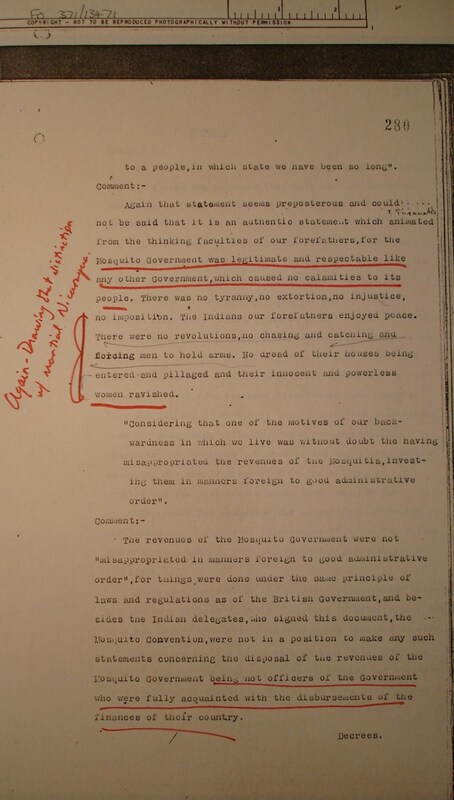 ¶ ‘Considering that we have agreed to submit ourselves entirely to the laws and authorities of Nicaragua, so as to form part of the political and administrative organization.’ ¶ Comment:- ¶ This we presume to state that in accordance with the then existing state of affairs these agreements were forced on our forefathers, the Mosquito Indians, as they the Indians were powerless to oppose the will of the Nicaraguan Government, and therefore we practically through fear, being entirely in the power of the Nicaraguan Government, compelled to comply with any statements and agreements purported and made by the Nicaraguan Government, being in total ignorance of the consequences and issues of such an agreement. ¶ ‘Considering that the lack of a respectable and legitimate government is always the cause of calamities . . . "
Cable from Mr. Stanford London, British Chargé d'Affaires, Managua, to British Foreign Office, London, re Miskitu Indian Petition submitted to Mrs. Anna Crowdell (but never formally submitted to British Gov't), p. 4. " . 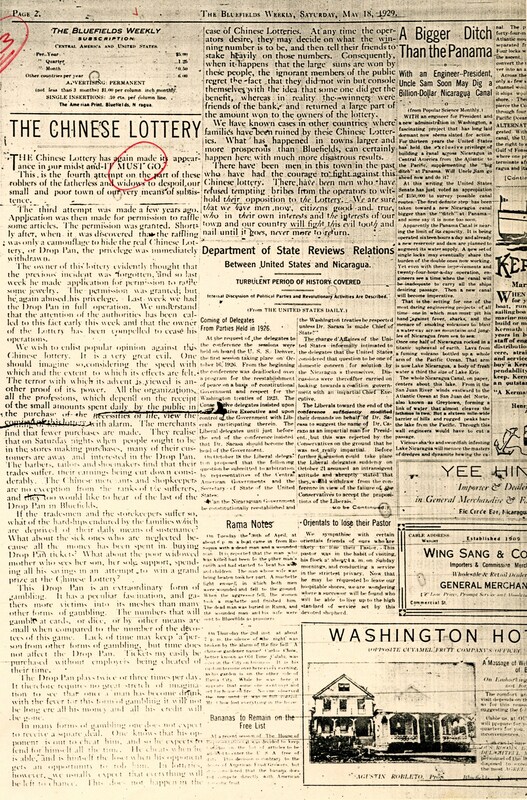 . . to a people, in which state we have been so long.’ ¶ Comment:- ¶ Again that statement seems prepositioned and could not be said that it is an authentic statement which animated from the thinking faculties of our forefathers, for the Mosquito Government was legitimate and respectable like any other Government, which caused no calamities to its people. There was no tyranny, no extortion, no injustice, no imposition. The Indians our forefathers enjoyed peace. There were no revolutions, no chasing and catching and forcing men to hold arms. No dread of their houses being entered and pillaged and their innocent and powerless women ravished. 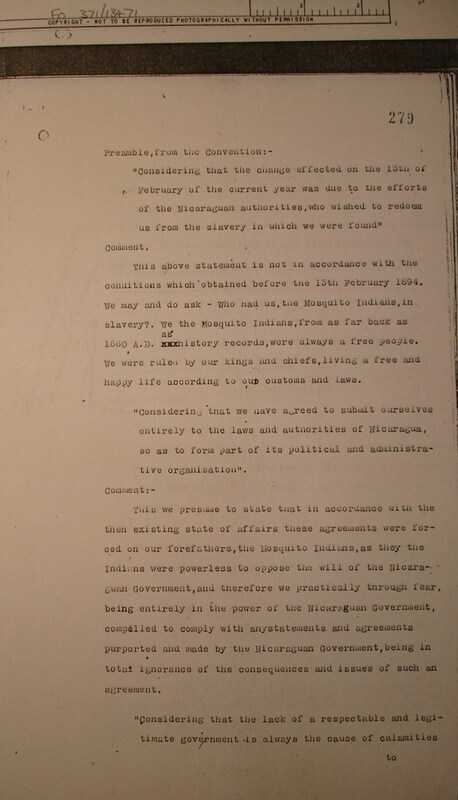 ¶ ‘Considering that one of the motives of our backwardness in which we live was without doubt the having misappropriated the revenues of the Mosquitos, investing them in manners foreign to good administrative order.’ ¶ Comment:- ¶ The revenues of the Mosquito Government were not ‘misappropriated in manners foreign to good administrative order’, for things were done under the same principle of laws and regulations as of the British Government, and besides the Indian delegates, who signed this document, the Mosquito Convention, were not in a position to make any such statements concerning the disposal of the revenues of the Mosquito Government being not officers of the Government who were fully acquainted with the disbursements of the finances of their country . . . "
Cable from British Chargé d'Affaires Stanford London, Managua, to British Foreign Office, London, re Miskitu Indian Petition submitted to Mrs. Anna Crowdell (but never formally submitted to British Gov't), p. 5. " . . . DECREES. ¶ Article 2. ¶ We ask the question, What has the Nicaraguan Government done with the revenues that have been collected on the Mosquito Coast for the thirty-four years of its occupation? ¶ ‘All revenues produced on the Mosquito Coast shall be inverted in its own benefit’ so says the decree of the solemn law and covenant, the Mosquito Convention. What benefits have we the Mosquito Indians and our country derived from the revenues produced on the Mosquito Coast? Let the Nicaraguan Government tell the world. What has become of the millions of dollars that have been produced and collected on the Mosquito Literal? Revenues from customs, from fines, from mahogany, from rubber, from bananas, from the killing of cows, pigs and turtles, from gold mines, from the denouncing of lands, from marriage fees, from passports, etc. Revenues are used by all legitimate governments, who are deeply interested in the welfare of the country and its people over which they rule, for constructing roads, for education, for postal facilities, for sanitation, for the general improvement of towns, for better communication and for just and impartial judicial administration. ¶ Where are the schools and colleges established? Where are the post offices? There is only in in Bluefields – and that was before the Nicaraguan Government took the country. ¶ Where are the improvements that have been made? Our beloved country has retrograded considerably. Our children have received no education. In fact we have been walking . . . "
Cable from British Chargé d'Affaires Stanford London, Managua, to British Foreign Office, London, re Miskitu Indian Petition submitted to Mrs. Anna Crowdell (but never formally submitted to British Gov't), p. 6. " . . . backwards for these last 34 years and now we the Indians are one hundred times worse off than before the Nicaraguan Government assumed our rulership. The Nicaraguan Government has failed entirely to fulfill its solemn promise and allegiance, that is ‘all the revenues produced on the Mosquito Literal’ have not been inverted in its own benefits and our economic autonomy has not been reversed to us. ¶ Article 3. ¶ This is again an ignored and broken promise, a solemn law and covenant disregarded. Will the Nicaraguan Government tell the world how many of us Indians have been taken and forced to bear arms, carrying guns and ammunitions, digging war trenches, carrying provisions for the army, doing military service? ¶ Yes, the Indians have been chased down like rabbits, caught and forced into military service. Many too have died in war. Remember the Mosquito Indians never made any war, never rose to up in arms against any people or nation. We were and are a peaceful people, but the Nicaraguan Government has taught us to fight against our wills to shed innocent blood. ¶ Article 4. ¶ Here again we declare that this solemn law has been violated for we the Indians have had to pay for killing cows, pigs, and turtles, for passports, five, ten, fifteen to twenty dollars for marriage fees. ¶ Article 6 and 7. ¶ Where are the Chief Inspectors? The Decree says only Mosquito Indians may be elected to these posts. Would the Nicaraguan Government mention by name and state the places at which they were and are stationed? ¶ (To be signed by the delegates from each Mosquito Indian village.)" The Bluefields Weekly, p. 1. The Bluefields Weekly, p. 3. "THE LEARNING OF THE SPANISH LANGUAGE. 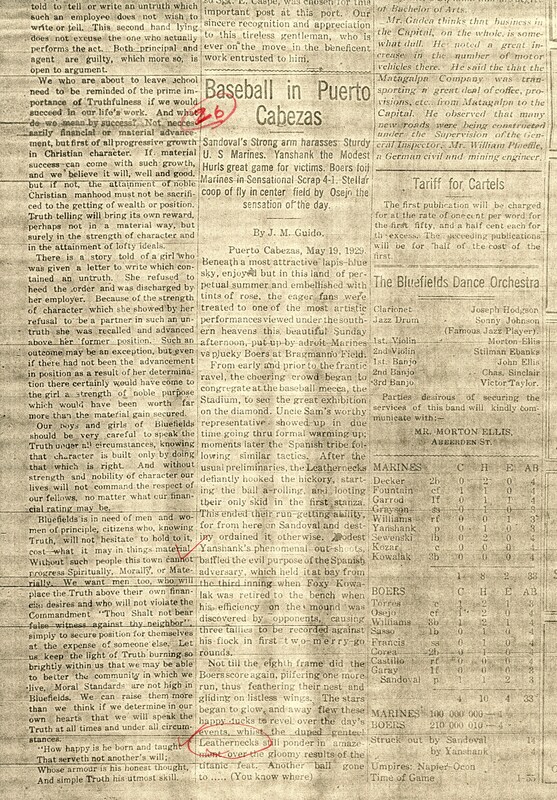 ¶ Since I have returned to the old and familiar surroundings, I am more firmly convinced that Bluefields, at this time standing upon the threshold of a new day, in political, economical and educational progress,---“ ¶ The foregoing is an excerpt from an article contributed by a Bluefieldian, which we publish in this issue. So great is the interrelation between political advancement, economical betterment, and educational progress, that it is well nigh impossible to deal exhaustively with any one phase of the question without treating the others in detail. ¶ We wish to make a few remarks with reference to the study of the Spanish language. Reflection will convince anyone that in this country, to deal with the subject from one point of view would result in the production of an argument or an article which would be unbalanced, and which could be incomplete. Anyone here who gives consideration to the study of the Spanish language from one standpoint only would certainly have a hard task in vindicating himself on the charge of being somewhat narrow-minded. ¶ We have seen in our last issue that the Government is expecting to undertake an extensive programme in connection with education, as well as in other respects. We announced that the Government School at Cotton Tree would be re-opened, and (- - - - - ) and we ( - - - - - -) the opportunity of having their children instructed in the Spanish language. ¶ We would also take this opportunity of making further comment in our remarks of last week. ¶ The majority of the Creoles here speak Spanish. But how well do many of them speak it? To what extent are they able to write it? With what degree of accuracy can they express themselves which bear a great deal of similarity to each other, but between which there are many subtle distinctions? 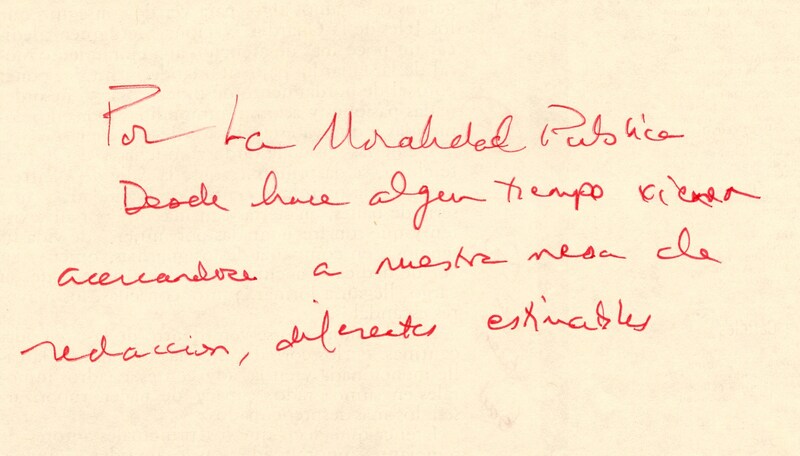 Yes, many of the Creoles speak Spanish, but very few of them have made a study of it. ¶ We believe that one of the reasons for the estrangement between the Costeños and the inhabitants of the Interior is the fact that each party is unacquainted with the language of the other. The inhabitants of the Interior do not speak English. Communication may be, and is made through the medium of the Spanish language, but such communication, on the whole, is one that (- - - - - -) of the translation of thoughts in a literal and (- - - - - ) and not in a sense that penetrates to the very thought and idiom of the language. It must not for a moment be considered that language is the sole difficulty in the way. There are many others. Not until the two faces have been found into the another and this is a matter of several years will the differences disappear. History will bear out this statement. This, however, is a digression. ¶ There are several vacancies on the staff of the educational establishments that are shortly to be opened, vacancies that are open to Creoles. Positions which will be given to them, if they are able, not solely to speak Spanish, but to speak and write it grammatically. How many will be able to step into these positions? ¶ Is it reasonable to expect that we can enter into the intricacies of our political life if we are not well versed in the language in which our politics are conducted? We may be patriotic, we may have the best of intentions, but is the opinion which we could give now in political matters be good as it would be if we had a better knowledge of Spanish? 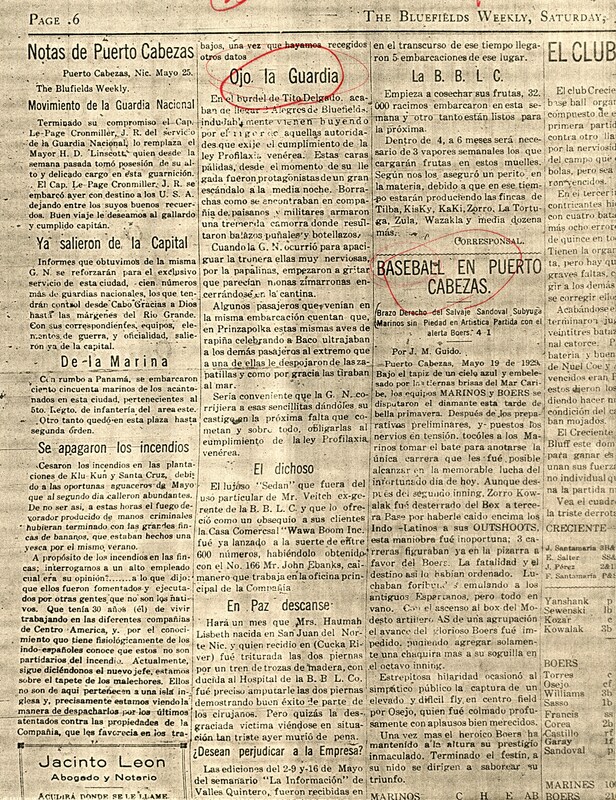 ¶ At school we may be able to acquire a general view of the economic situation of or country, but the person who desires to get to the bottom of things, who wishes to pry into every detail, the man who is to be an asset to Nicaragua in the future as an economist, must have a thorough knowledge of the Spanish language. ¶ And what of the educational standpoint? How much has that man lost who can understand language when it is spoken on the street and what can make himself understood, but who has not educated himself to appreciate the rhetorical (- - - ) of the different figures of speech and to enjoy the nuances offered for his intellectual pleasure? How much has he lost who cannot delight in the musings of the philosophers of his own country? How illiberal in his views must he be who cannot by reading the history of his compatriots—separated from him by perhaps 170 miles, a difference of culture and a difference in training,--get to know something of their ways of thinking, their philosophy of life, and thus make allowances for what may to the uninformed appear as striking eccentricities? ¶ One never knows too many languages, nor is his education complete unless he understands and speaks several tongues. When one leaves his own country to travel abroad he will find how necessary it is to understand the language of the country he visits”. 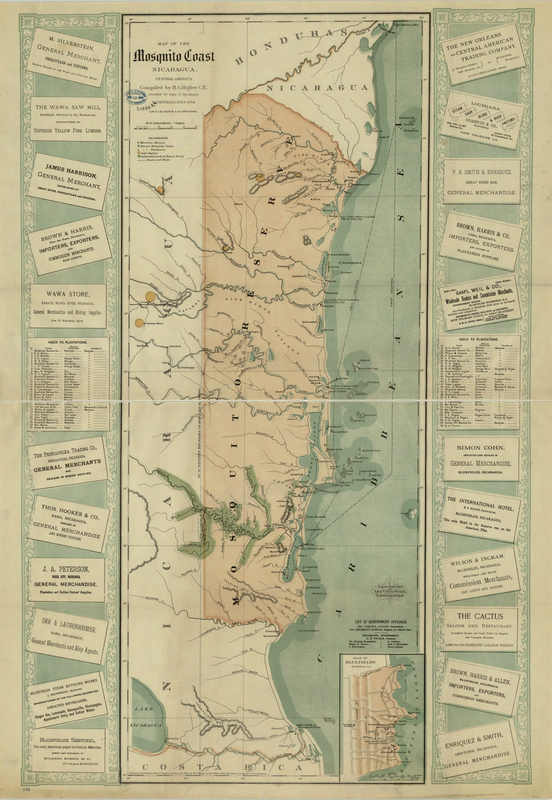 ¶ Self-interest, which is the strongest motive of human action, would suggest that we Creoles should not wait for our Spanish-speaking brothers to learn English, but we should learn Spanish, and move forward to assist them in the noble task of steering Nicaragua upward to the fulfillment of her noble destiny." 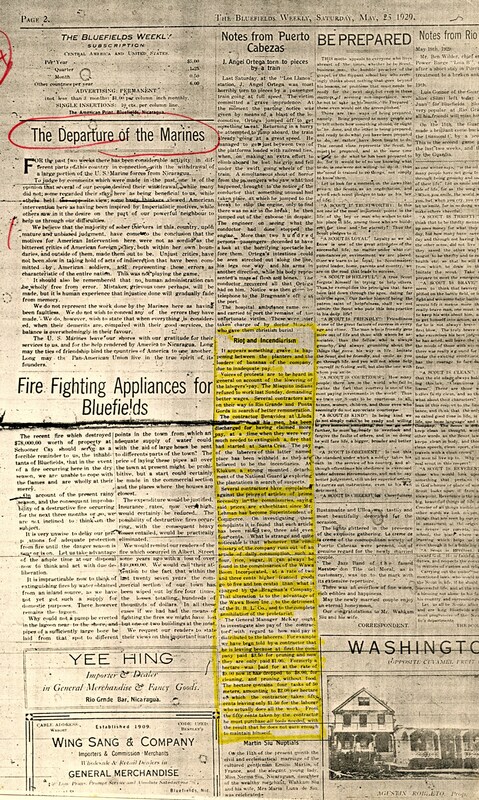 The Bluefields Weekly. "RE THE NATIONAL GUARD ¶ On Monday morning Private Wilson arrived from Rio Grande with four Creole recruits for the Guard. He returned on Tuesday on board the Cuyamel Fruit Company’s Power Barge. ¶ Lieut. Medley has returned to Rama and relieved Lieut. Stone who has come back to resume his regular duties at the Bluff. ¶ The latest weekly reports from La Cruz and Rama indicate that the Guard is performing its duties efficiently and that no unpleasant situations are arising in its dealings with the civilian population. The Political situation is quiet: there have been no military operations, nor has there been any friction between the law officers and the public. The attitude of the public towards the Guard is a favourable one. ¶ Economic conditions at la Cruz are at a low ebb. There is however work for labourers. The farmers are cutting more fruit than the Companies can handle. ¶ GLEANINGS FROM PUERTO CAB EZAS ¶ Guardia National at this Port. ¶ We note with sincere pleasure undeniable correctness observed by Guardia Nacional in our neighborhood, conforming to the enviable ethics of justice and good order, for which it has been established. For this brilliant success we foster but kind regards for its Chief the Jovial Major H. D. Linscott who through his energetic efforts and ever present zeal has reached the aspired object. Efficiency. Constant drilling is prevalent at Guardia’s bivouac and surroundings, where today 46 enrolled men are being disciplined for the benefit of public order. ¶ UNIQUE ADMINISTRATION AS COMANDANTE ¶ In the interest of the common welfare of this busy port, we frequently visit the Comandancia to gain information from which we have drawn conclusions of the irreproachable bearing of the esteemed Lieut. C. R. Darrah of Springfield, Illinois. For him and for his amiable wife, señora de Darrah, a Latin-American daughter of Santo Domingo in the charming Isle of Haiti, we extend cordial expression of friendship and good will. ¶ MILITARY FUNERAL ¶ Carlos Balentine (Mosquito Indian), recently recruited for service in the Guardia nacional at this station, died of pneumonia at Bragman Bluff Lumber Company’s Hospital. It is worthy to mention that he was honored with a final tribute of a military funeral, and escorted to cemetery by all officers and men of the Guardia nacional. We can not conceal the fact that worthier act of democracy can not be recorded." Letter from Gen. Dion Williams, Managua, to US Consul Matthew Hanna, Managua.